Nice, simple and user-friendly. Unfortunately, none of those Linux programs have it. They all require that you pin-point each file. Sometimes I even add a file somewhere deep in directory structure, and forget about. I only catch the problem when I (or someone else) figure it is missing when working on another computer. 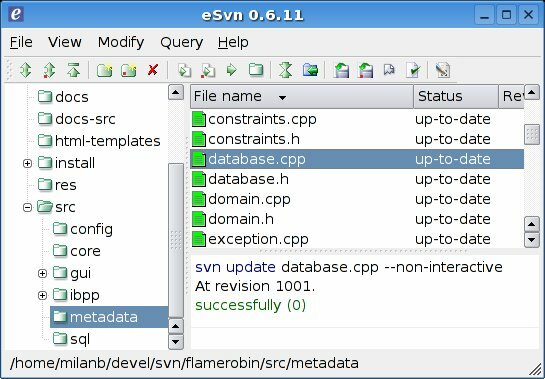 I tried to circumvent the problem by running the “status” command, but eSVN for example lists all files, since it envokes “svn status” with verbose flag. Who ever uses that feature I wonder? Anyway, from all those, I prefer eSVN for its user interface. It is clean - so it’s easy to spot the changes, and it doesn’t flicker like RapidSVN. KDEsvn seems quite good, but it has a lot of background “syncing” with the repository (I think I’ve seen the option to turn it off, but didn’t bother). Why do tool makers add some extra-cool-whatever-used-by-nobody features instead of adding the esential ones? It really escapes me. Given all this, I’m still using command-line svn from terminal most of the time. Sometimes I run svn status in terminal, and then hunt for files in GUI. To all those “Linux desktop” proponents: If you want to see quality Linux desktop - make some pressure on developers of these tools (I’m trying by posting this on my blog). And they need to do it properly. We can do checkout manually, we can do merging and other once-a-year stuff manually. But this day-to-day features must work. All the tools I tried only implemented update and commit as they should, “add” and “status” need to be connected.